The time of the future has finally arrived. 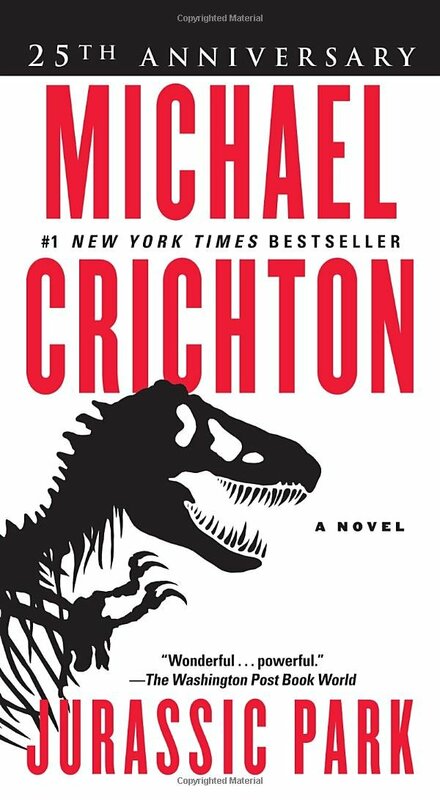 Scientists Alan Grant, Ellie Sattler, and Ian Malcolm are invited to an island owned by John Hammond, who has finally made the breakthrough the world has been waiting for: The return of the dinosaurs. The island has Raptors, Brontosauruses, Apatosaurus, and even a Tyrannosaurus Rex. But then it all goes wrong. When the exciting vacation suddenly turns into a living two-day nightmare, the small group of survivors are forced to band together. The only question is--who will make it out alive? This was a very exciting book, full of suspense and action and excitement. The science behind the creation of the park and dinosaurs actually make sense if you think about it. The book posed some interesting questions, like if it is even a good idea to bring back things from the past, or what impact will it have on society and even mankind as a whole? The only thing I didn't enjoy was the bad language. I would recommend this book to people who enjoy action and suspense and sci-fi adventures. This is also for people who don't mind reading long lectures on scientific theory, because once you get past those, that's where the action comes in. This is also a book for people who don't mind getting a little gruesome in their reading (just as a heads-up). Nemesis is a word and name that indicates negative influences, just like all the other Diabolic names. Diabolics are soulless, savage creatures, incapable of any human emotion other than love and rage. Or so everyone thought. When Nemesis is sent to the court of her tyrant King, she encounters unexpected situations: a supposedly insane but handsome man, a plot to destroy the king, dark motives, twisted lies, and . . . true love? When it comes down to it, will Nemesis trust what everyone's been telling her, or her heart . . . which tells her she can be something more? I really enjoyed this book because it was a fantastic story about how a young woman breaks free of what everyone has told her about herself--and what she believed--and chose to be someone SHE wanted to be. Nemesis is also a very interesting character because she's strong and brave, but utterly confused by what her heart is telling her, and her head. But what I didn't like was that there were some sexual references--not a lot, but some. This is a good book for anyone who likes a cool, strong, karate-chopping girl who finds out who she is only by not listening to the voices she had been listening to her entire life. There is some romance in it too, as an added bonus, which really makes Nemesis's whole world flip upside-down. Also, if you like the victory of a scenario where a tyrant is given his dues and replaced by a better person, this is also a good book. But here's a warning--this book is a little emotionally chaotic, especially at the end (personally, I relish it). Fahrenheit 451 is about a future in America where books are burned by firemen along with the houses that are hiding books. Montag, the main character, has been a firefighter for 10 years. He has never questioned why they burn the books until he meets a 17 year old girl who tells him about the past and how no one was afraid of thinking. I liked the book because I enjoy reading books about the future. It makes you think about how the future can be if people were to stop thinking. I like how the book had a young girl who was questioning why the future was so different from the past. It makes you think about how our present is different and sometimes worse than the past of many. I would recommend this book to people who has ever questioned why we do things the way we do them today. Anyone who thinks about how different the future will be should read this book. Also the book is a great example of how there will always be people who will not settle for what everyone is doing and will always try to change things for the better. Cinder is a cyborg who lives with her stepmother and stepsisters. One day, Cinder's stepsister Peony gets a deadly virus, and Adri (Cinder's stepmother) gets extremely upset at Cinder and signs her up for testing cures on people who are willing to volunteer. There, Cinder learns a lot about who she really is, and how she has to save the world from the Lunar people from the moon. I really enjoyed Cinder! It was a great book, with lots of action and romance and cliff-hangers. I would recommend this book to other girls who like romance and action with a touch of mystery.